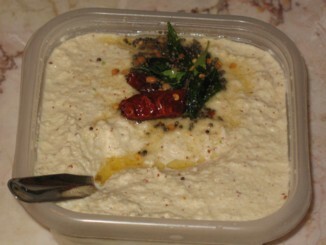 Coconut chutney is a popular side-dish with south-indian snacks such as idlis, dosas, uthappam etc. Also, is a good dip with fried snacks. You can make the chutney mild or spicy to your liking and taste. The one we have at our place is a simple one with no onions, garlic, and low in spice. The chutney tastes best with fresh coconut. I used fresh coconut as we don’t find the frozen coconut juicy enough for chutney. In case you are using frozen coconut, thaw it for about 30-40 seconds or till the coconut is soft. If the coconut is chopped into pieces, begin by grinding it in a chutney jar or a food processor. If the coconut is grated, start with the dalia. Grind for about 3-4 minutes (1 minute batches). Add the rest of the ingredients, including salt to taste – except the tempering ingredients. Grind to a puree of slightly coarse consistency using little water. Transfer to a serving bowl/container. For the tempering, heat the oil in a small frying pan. Add the mustard seeds and udad dal to the oil. When the mustard seeds pop and the dal begins to brown, add the dry red chilly, curry leaves, and asafoetida powder. Turn off the heat. Fry the ingredients for a few seconds and add to the chutney. Mix well. Check and adjust the salt and consistency to your liking. It is ready to be served and enjoyed! If not using immediately, you should refrigerate it – stores for a couple of days – but best tasting fresh. In earlier days, chutney used to be ground on a stone (called ammi-kallu in tamil) – that gives the best flavor and taste to the chutney. wen i prepared with medu vadas, got vry nice compliment from my better half.. thanks it really added, not a pinch but loads of love to the food. Hi. Looks good. I have tried by adding a little Imli (Puli) and it adds to the taste. This work by Skribles is licensed under a Creative Commons Attribution-Noncommercial-No Derivative Works 3.0 United States License. Click here to view my awards!